eCite - Equity Transmission Mechanisms from Asia to Australia: Interdependence or Contagion? 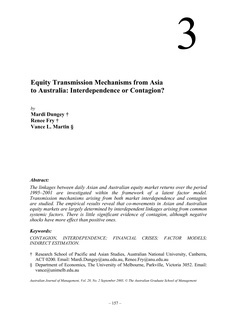 Equity Transmission Mechanisms from Asia to Australia: Interdependence or Contagion? © The Australian Graduate School of Management 2003. The linkages between daily Asian and Australian equity market returns over the period 1995–2001 are investigated within the framework of a latent factor model. Transmission mechanisms arising from both market interdependence and contagion are studied. The empirical results reveal that co-movements in Asian and Australian equity markets are largely determined by interdependent linkages arising from common systemic factors. There is little significant evidence of contagion, although negative shocks have more effect than positive ones.